“ADDRESSING THE GENDER GAP IN NORTH-WEST TUNISIA”: WOMEN BENEFIT FROM GENDER CONCERNS INTERNATIONAL’S INITIATIVE. Ms. Sabra Bano, director Gender Concerns International expressed her gratitude to the Ministries of Agriculture and Women and Family in Tunisia for their support to women`s economic empowerment in North-West region in Tunisia. She was addressing a conference jointly organized by partner organisation ATFD and Gender Concerns International Tunisia. She congratulated project team that has reached out to a target number of beneficiaries in the region and the other stakeholders in concerned national institutions and the media. A large number of activists including women from the region attended a two days consultation strategising on continuation and sustainability of the program. The project, “Enhancing Women’s Economic Participation: Addressing the Gender-Gap in North-West Tunisia” targeted the economic empowerment and financial independence of local women in the face of their future as job-seekers and entrepreneurs and was supported by the Dutch Embassy in Tunisia. 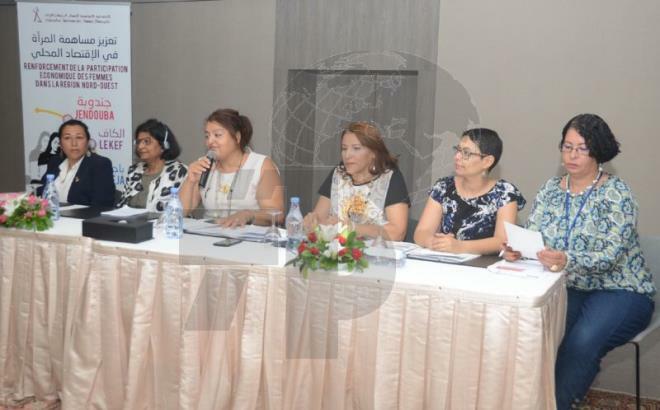 Together with Association Tunisienne des Femmes Democrates, Gender Concerns International contributed to the organization of Guidance and Information Workshops, Awareness-Raising Campaigns and a Multi-Stakeholder Conference engaging key stakeholders and the national media. Gender Concerns International is committed to support women and women`s organisations in Tunisia to strengthen economic empowerment, inclusive political participation and better services delivery to the community and it will continue supporting Tunisian women in their quest for an inclusive and gender-sensitive future in the region. In 2014, Gender Concerns observed both the Parliamentary Elections on the 26th of October, as well as the Presidential Elections on the 23rd of November in Tunisia. The mission comprised of 110 female observers, deployed across 22 governorates. The Parliamentary Election was monitored from a uniquely gendered perspective with a focus on women's inclusive governance in Tunisia. The mission was undertaken jointly between the LTDH, ATFD, AFTURD and Gender Concerns International. It was a continuation of our partnership that began with our joint Gender Election Monitoring (GEM) Mission in 2011. Furthermore, the mission was supported by the German Federal Foreign Office (AA). In October 2011, the first free elections after Ben Ali's downfall were held in Tunisia. It was a historic day for the country, but also for the entire Middle East and North Africa (MENA) region. In fact, the Tunisian elections were the first to be held after sweeping democratic movements put an end to some of the most long-lasting authoritarian Arab regimes. During the earlier post-revolution period, NGOs and civil society organisations advocated to enhance and increase women’s visibility in the process of democratic transition. In due course, a decision was made to integrate a gender component into the Election Observation Mission undertaken by the Observatory of Elections for the Constituent Assembly. As part of this integration, Gender Concerns International was invited to observe the elections from a gendered perspective. Consequently the GEM Mission, the first of its kind in the region, was led, organized, and implemented by women from NGOs and experts from the field. The mission involved 22 young women led by four senior national observers and seven international observers.